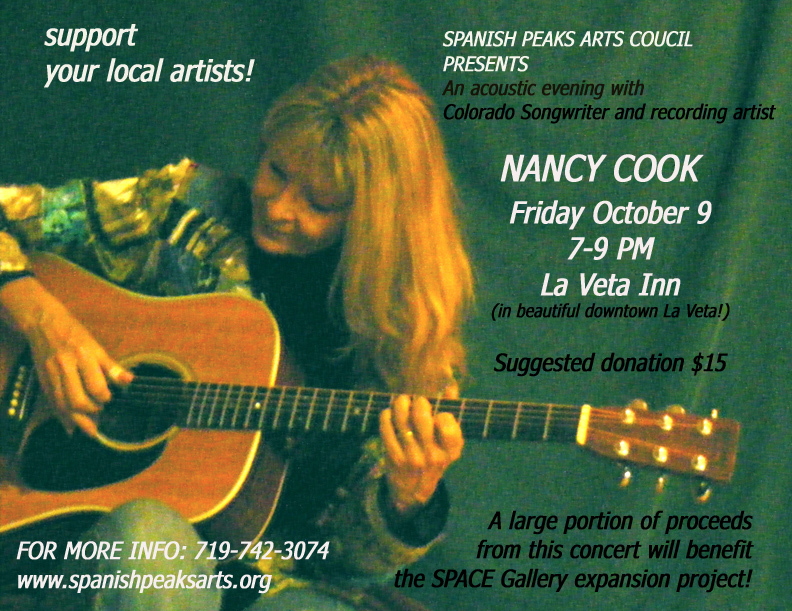 After quietly developing plans to expand the building housing the Gallery of the Spanish Peaks Arts Council (SPACe) in the La Veta Town Park, SPACe kicked off the fundraising campaign with a party on August 10 at the Parkside Gallery. 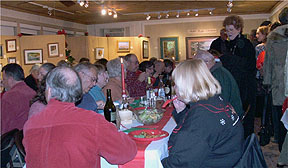 The party was an entertaining wine and cheese event with music provided by David and Annie Enke for no admission fee. The architect’s drawings of the building and floor plans were on display. Steve Perkins introduced the SPACe Board of Directors. President Kathy Hill spoke about the history of SPACe and the gallery building as well as what the new 2-story addition will enable the organization to do. Fundraiser John Manos spoke of the campaign to raise the projected funds needed to complete the project. Kathy Amato, President of the Cuchara Hermosa, presented SPACe with a symbolic $10,000 gift for the building fund. The next step called for expansion of the building to gain much needed storage space, but since the building sits on town park land, delays occurred due to the lease held between SPACe and the Town. When a survey required by the Town Board revealed that SPACe land extends further to the east, the SPACe Board put a hold on plans in order to consider a more extensive expansion. After presenting a revised petition to the Town, variances were granted allowing up to 1500 square feet of expansion, with much of the additional space being on a second floor. SPACe was equipped with a beautiful plan by Trinidad architect Alan Petersen that retained the integrity of the original stucco building and created a handsome two story addition. Happily SPACe raised substantial donations and in-kind contributions by volunteers. The estimated cost to build the addition was $250,000. SPACe planned to raise that amount and to be ready for construction to commence within two years. The new addition gives SPACe double the display area with a 900 square foot addition, allowing more than one exhibit to be held at the same time. The project will also added 500 square feet of work space on the second floor which can be used for workshops or meetings. More area is available for the artisan gift shop as well as the much needed storage space. 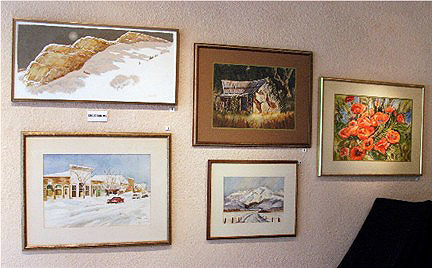 Over the last 30 years, SPACe (and its predecessor, Friends of the Arts Guild) has contributed significantly to the arts in Huerfano County. 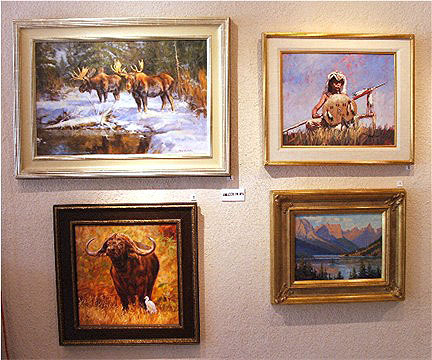 It has presented musical performances and recitals, Children’s Art Workshops and scholarships as well as ongoing art exhibits featuring over one hundred southern Colorado artists. SPACe also works with the La Veta Schools to present an annual student art show. 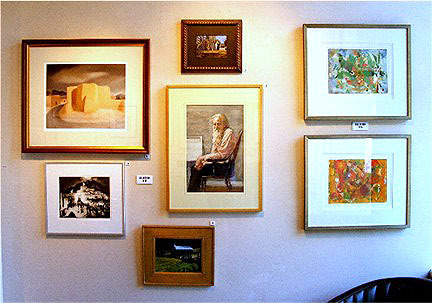 The SPACe Gallery provides a non-judgmental environment for beginning and professional artists to share their work with the community. 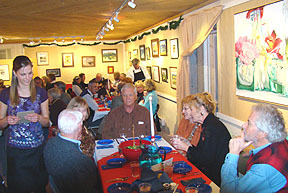 A progressive dinner that served guests at three outstanding art galleries in La Veta–appetizers at Piñon Hill Pottery, main course at the SPACe Gallery and dessert at the La Veta Fine Art Gallery. 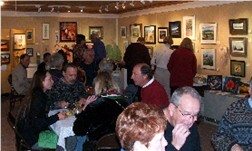 Drawings were held for artwork donated by local artists. For each contribution of $100, a ceramic tile will be made and designed by local potters Nicole Copel and Polly Harris, that includes the name of the donor, or the donation can be given in the name of someone else. The tiles will be integrated into an architectural statement in the new addition to the gallery, providing a long-lasting and beautiful connection with the arts. 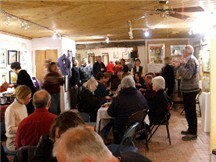 All donations are tax deductible and giving a tile in the name of someone who loves the arts would make a great gift. 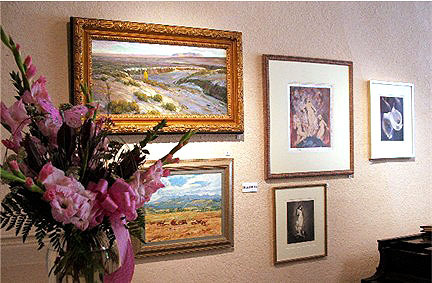 A Gala ONE DAY ONLY exhibit of artwork from private collections in the La Veta – Cuchara area. 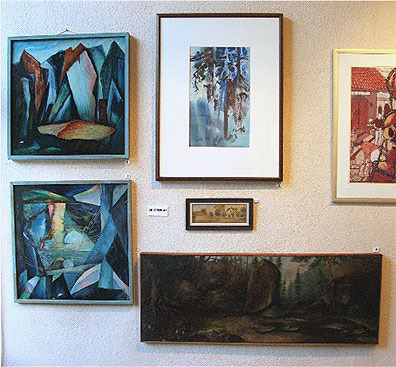 Like the magical Brigadoon, the La Veta Art Museum made an appearance only once, at the Parkside on Sunday, July 26 from 3 – 6 pm. 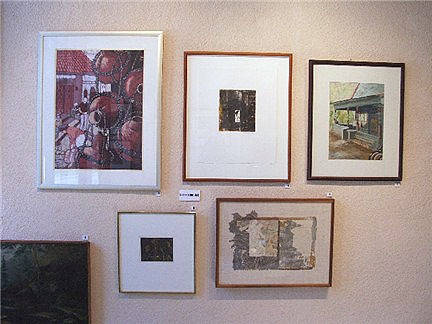 A truly significant display of original art which included artwork from all over the world. Kathy Hill, President explains the Building Expansion, while Deb Donovan and Linda Frederick serve up great food and drinks. 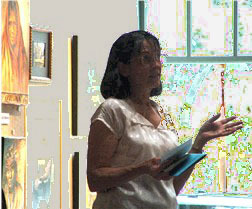 Thanks to Carole Kramer for countless hours spent putting this event together, along with Deb Donovan. Many guests enjoyed the special show. 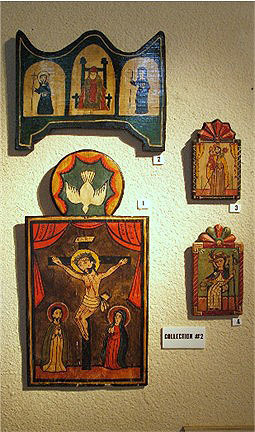 Here are the 10 collections. Nancy’s performance was truly special. Thank you, Nancy, for donating to the SPACe Building Expansion! 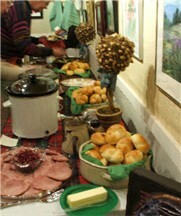 Thanks, too, to Angela and Randy Collins for making all the arrangements and bringing Nancy to La Veta. 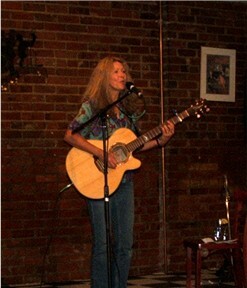 To learn more about Nancy’s CDs visit her website — www.picklehead.com. Special DVDs of her performance can be purchased at the SPACe Gallery with all funds going to the Building Expansion Fund. 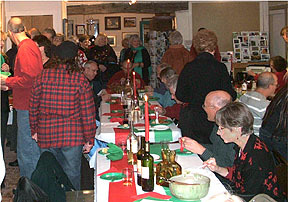 December 5, 2009 â 5:30 – 7:30 Fundraiser for the SPACe Building Expansion Fund. 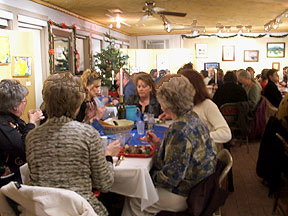 A progressive dinner serving guests at three outstanding art galleries in La Veta–appetizers at Piñon Hill Pottery, main course at the SPACe Gallery and desserts at the La Veta Fine Art Gallery. 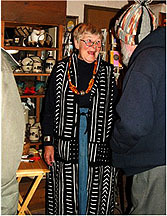 Ann & John Gethen, Polly (our potter), Pat Nolan, Judith Baker Montano, Mary Jean & Jim Fowler, Mary Jane Butler, Deb Donovan, Diane Buchanan, Gerry Benesky, Katharine Emsden, Betty Ellwell, Robin Richards, Carole Kramer, Sandy Marshall, Donice & John Manos, LaClaire Skaggs, Pat Newell, Kathy Hill, Shillinglaw, Judith Fuentes, and Karen Gale. 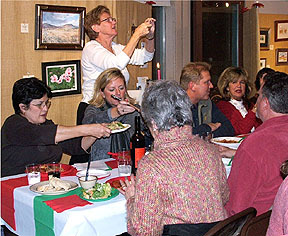 LVSA lent the use of tables and chairs. 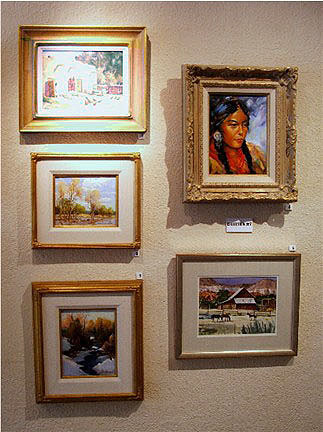 View the excellent and varied art collections of five couples in Pinehaven, a unique mountain community nestled between Cuchara and La Veta. 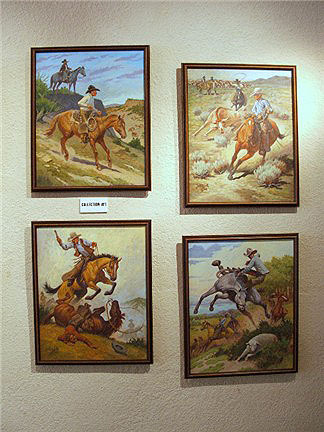 The collections on the tour include that of LaClaire & Leon Skaggs, Don & Kathy Brown, Charles & Linda Chauvin, Skip & Alice Johnson, and Wayne & Sandy Ware. Tickets for this fundraiser are $20 and are available in advance at Charlie’s, the SPACe Gallery, and from each of the collectors on the day of the tour. Refreshments will be provided. to the Pinehaven entrance just beyond Mile Marker 15, turn right into the Pinehaven entrance and follow the signs. This year’s dinner was served restaurant-style with seven lovely volunteers from La Veta High School serving the 54 guests at each sitting. 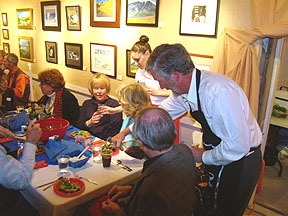 A Country French dinner was served in three courses at three La Veta art galleries. 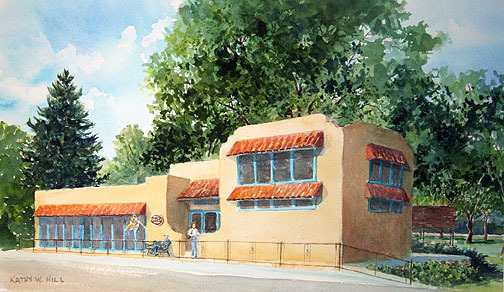 Piñon Hill Pottery, La Veta Fine Art Gallery, and Spanish Peaks Arts Council Gallery in two sittings. 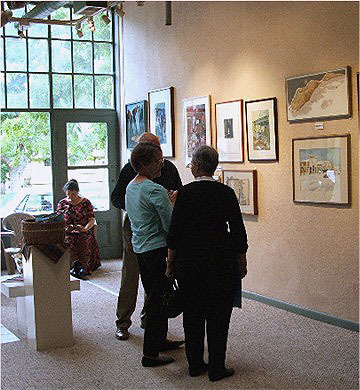 Early sitting appetizers were served at Piñon Hill Pottery 5-6 pm; Main course at the SPACe Gallery, 6-7 pm; Desserts at La Veta Fine Art Gallery beginning at 6:30 pm. 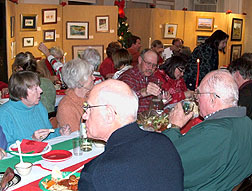 Late sitting appetizers were served at Piñon Hill Pottery 6:30-7:30 pm; Main course at SPACe Gallery, 7:30 pm; Desserts at La Veta Fine Art Gallery beginning at 6:30 pm. 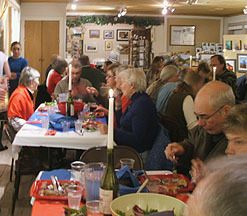 Choices of Coq au Vin, Boeuf Bourgninon, or vegetarian Cassoulet were offered to the diners. In addition, there was live music by the Savages at North by Southwest. 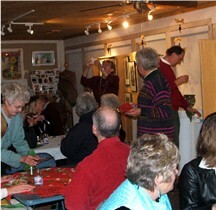 A few lucky diners won original artwork donated by local artists. All for $25 per person. The recipes for the delicious meals were provided by Judith Baker Montano and prepared by volunteers who not only donated their time but also the ingredients. Judith orchestrated the organization of the entire event, instructing the servers, and creating a wonderful event that ran smoothly. 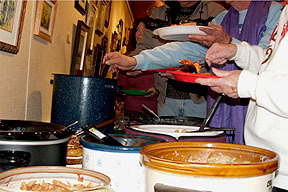 Many of the chefs also assisted serving the dinners. These volunteers included Gerry Benesky, Deb Donovan, Katharine Emsden, Mary Jean Fowler, Ann Gethen, Kathy Hill, Jessica Newton, and Laura Smith. Judith also contributed to the main course entrées. 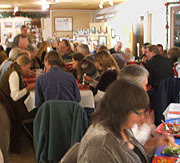 In addition, several volunteers helped serve wine as well as meals, including Ed Donovan, Maggie MacIndoe, John and Linda Frederick, John Gethen, and Bert Rosen. John Manos and Deanna Oberheu helped recruit the volunteer waitresses–Christine Koutnik, Cara Campbell, Gina and Sophia Schneider, Jacey Day, Karlie Corsentino, and Sammie Willhoit. 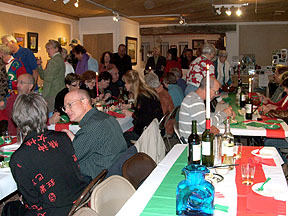 Businesses and others who contributed to the success of the evening include the La Veta Library for chairs, La Veta School of the Arts for chairs and tables, La Veta Liquor, Charlie’s Market, True Value Hardware, the Ryus Ave. Bakery (food and kitchen), the Parkside Gallery (kitchen), Tom Lessar and his excellent crews, Polly Harris and Ernest Shealy. 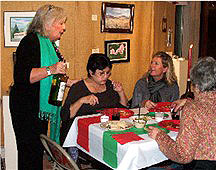 In addition, the artists at La Veta Fine Art Gallery contributed their time and desserts as well as Nicole Copel and her assistants at Pinon Hill Pottery, who contributed their time and appetizers. THANK YOU TO ALL!! And especially to all the guests who contributed to the building expansion by purchasing tickets to the event!